Justin's WeatherTalk: It's Getting Old. More Rain, More Cold! Sorry I did not post this weekend, the radar maps are fixed and I am back on track this Monday morning- with a fresh box of Kleenex. Just wait, while the trees and flowers are working already, one of these days it will warm up and fully kick into overdrive. But thankfully (while the allergies are bad enough) it is cool. For the month, we are below normal, and it looks like all of this week will stay there. In fact we will be averaging 10F-15F below normal for a few days, and winds will be gusting up to 30mph helping to spread that pollen around. Today's record low of 39F was set just 5 years ago- 2003. No big whoop, right? Take a look at the almanac yourself, you'll see that 10 record lows for May were set since 1996. Considering that the records go back to 1880, that is a statistical anomaly. Does this argue against Global Warming? Well, it's tough to use just Baltimore stats for that (although I often do). No, I would lean more along the lines of the shift in patterns. How often have you heard that we jump right from winter to summer? The reason is something I described a few weeks ago. The blocking pattern in the North Atlantic (-NAO) is something we would look for in the winter to bring us snow, but have we had much snow- No!. It's a pattern that routinely develops in the spring- or this year in mid March as seen in the graph at the right.. The result is holding our temperatures down- seemingly delaying the warm up we would expect. As soon as the pattern relaxes, getting back to normal or slightly above will feel like a burst of heat. That is likely to be our June story. But for now- here is our upper level pattern. 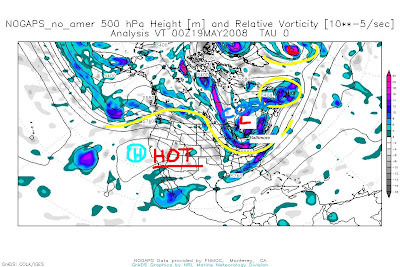 I've highlighted the jet stream in yellow. The upper level trough in the east is in part due to the Icelandic Low (upper right). It's a semi permanent position that can linger for months. So our weather can change daily from storm to storm, the track or path persists. While this pattern continues to keep the storm track over the mid Atlantic, it is also allowing the west to bake under a ridge (High Pressure). The haves and have nots- all balance out the extremes. While we will stay 10-15F below normal, Arizona will be 10-15F above normal That means places like Phoenix expect a high of 106F-108F. Not, that's not a record. That is 113F set back in 1984.